Alessandro Michele grew up in the ’80s—the celebrated Gucci designer was born in 1972—so surely he remembers well the gaudiness people had to endure in the form of baubled sweaters and Max Headroom futurism. But this is a dude who never met a gaudy he didn’t like, so welcome to the Spring season of Gucci, which reads like a glam version of the Stranger Things costuming, and feels slightly sadistic. Michele’s obsession with vintage pastiche is well documented, and it seems he mostly hit the limit on his desire to dress fashion women like murderous vampire schoolmarms from a 1974 cult film, but hot pink. With Spring 2018, the question he seems to be asking is how far will you go for horreur? Pick your poison! Are you the Upper East Side vamp, who hits Fiorucci just before close because you don’t wake up early enough to go at a decent hour? Are you obsessed with Run-DMC’s Raisin Hell but too bougie to just steal a Mercedes hood ornament? Or, thirdly, are you obsessed with Liza Minelli and Cabaret but also Debbie Gibson and Jazzercise? No matter your vibe, Michele’s got you covered here, pals. But of course, there can only be one Barb. 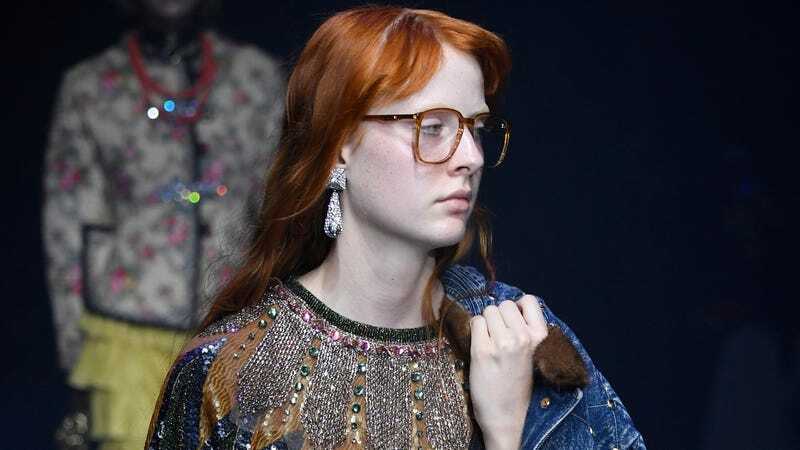 The designer channeled the ginger nerd icon through a similarly-tressed model, the kind of frumpy brown glasses that make everyone look slightly dour and unwashed, a jean jacket with rivets, and a sequined and beaded sweater, because Every Day Is Christmas Day in the Lord’s eyes. Also note: the cheeky misspelling of “Guccy” on the handbag, in a font “inspired by that of Sega, the interactive entertainment company.” And so Gucci’s PR font can tout this collection’s multiplicities all it wants—it’s Michele, he’s always frothing over multiplicities—it’s clear the strongest influence here comes from that moment just before the technological age went over the edge, when kids could bask in its possibility but adults didn’t have to worry about things like cyber-homicide. But then maybe the message is that time is a flat circle, like a sweater that warns “NEVER MARRY A MITFORD,” a reference to the DIY sweaters of a duke who actually did marry a Mitford, and also the fact that Gucci is sponsoring an exhibit of said sweaters. (All fashion is a form of advertising, I guess.) Or maybe the clearest message of all is that Alessandro has been spending a lot of time on Netflix.